Michael A. Cramer is an actor, director, filmmaker, and scholar, and he teaches communications and theatre at the City University of New York. He has published articles and reviews in Theatre Journal, Medievalism, and Sixteenth Century Journal. Historical re-creation and re-enactment organizations of various sorts have become so popular that they constitute one of the major ways that ordinary people with a deep interest in history interact with the past. Yet the scale, complexity, and variety ofthis activity is hardly known to scholars, whether they study popular culture or academic history. Michael Cramer here discusses the Society for Creative Anachronism, one of the oldest and most influential of such organizations, and explains in lucid prose why its distinctive mix of re-creation, fantasy, and role-playing has attracted thousands of members over the last four decades. 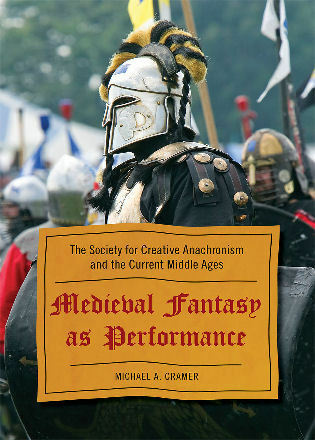 Cramer's analysis will prove useful to anyone interested in or working on the significance of role-playing or re-enactmentin modern society..
Michael Cramer's Medieval Fantasy as Performance is a fascinating study of the Society for Creative Anachronism and its fabrication of a conception of the Middle Ages that serves the purposes of recreational medievalism. This is one of the most insightful books on modern role-playing and re-enactment that I know of, and certainly the most entertaining in its revelations of how scholars and playboys turn the imagined king game into an entire way of life!!!! In this book, Michael Cramer views the Society for Creative Anachronism (SCA), an organization that studies and recreates the middle ages, as a case study for a growing fascination with medieval fantasy in popular culture. He explores the act of medieval re-creation as performance by focusing on the SCA, describing the group's activities, investigating its place in popular culture, and looking at the SCA not so much as a historical society but as an on-going work of performance art; a postmodern counter-culture riff on what it means to be 'medieval.' Cramer examines the group's activities, from persona and character development to theatrical performance and personal interaction; from the complex official ceremonies to full contact armored combat with mock broadswords. He explores the SCA in detail to discover how its members adapt and employ ideas about the Middle Ages in performance, ritual reenactment, living history, and re-creation, analyzing the performance of identity through ritual, sport, drama, and personal interaction, and he focuses on the reconstruction of the medieval 'king game,' a game in which a mock king is chosen to reign over a mock court. The book also studies various ideas about medievalism, including the contrast between reenactment and re-creation, and places these activities in the context of contemporary American society. With three appendixes, a bibliography, and a selection of photos, Cramer demonstrates how and why medieval fantasy is increasingly used in popular culture and analyzes the dissatisfaction with contemporary culture that leads people into these realms of fantasy.